Oracle Database releases are released in version and version_full releases. The version is designated in the form major release numeral.0.0.0.0. The release version is the annual release designation of the database software. For example: 2018 is the release year, and the release version is 18.0.0.0.0. The version_full release is updated using numeric segments that change, based on the annual release designation of the software, the quarterly release update version (RU), and the quarterly release updates revision (RUR). Second numeral: Oracle Database Release Update (Update) in Oracle Database 18c and later releases. For example: 18.3 is Release Update 3. 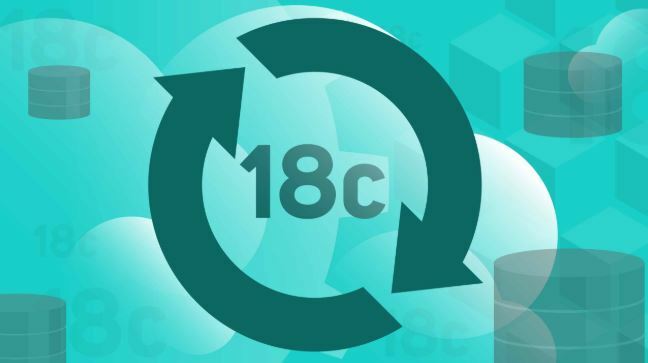 In releases before Oracle Database 18c, the second numeral designates a maintenance release number. For example: Oracle Database 12c release 1 (12.1); Oracle 12c release 2 (12.2). Fifth numeral: This numeral is reserved for future use. 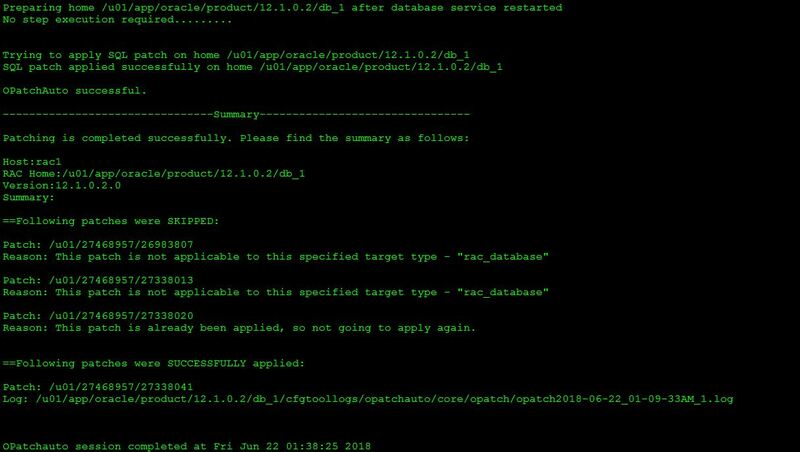 Oracle strongly recommends that you apply the most recent release update (Update) or bundle patch or patch set update to your source and target databases before starting an upgrade, and before starting a downgrade. 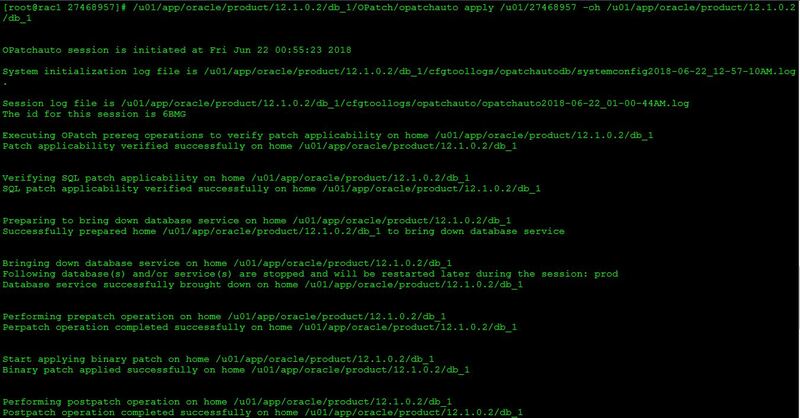 Check the opatch version and inventory for ORACLE_HOME. 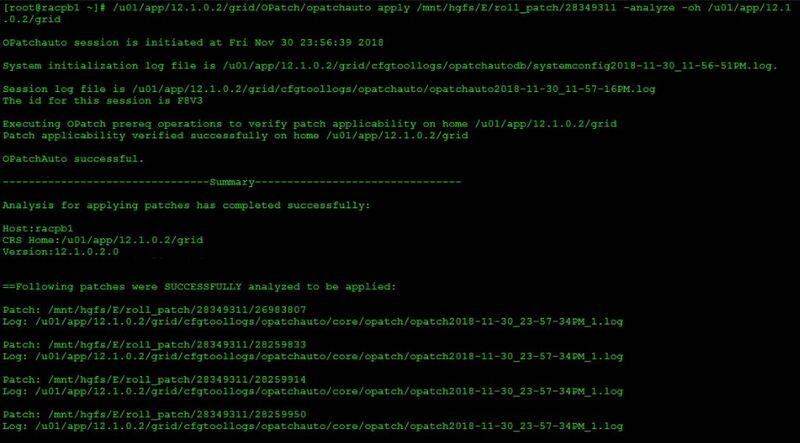 Minimum version of OPatch utility version 12.2.0.1.14 or later to apply this patch. Copyright (c) 2019, Oracle Corporation. All rights reserved. Patch description: "Database Release Update Revision : 18.3.2.0.190115 (28790643)"
Patch description: "UPDATE 18.3 DATABASE CLIENT JDK IN ORACLE HOME TO JDK8U171"
Patch description: "OJVM RELEASE UPDATE: 18.3.0.0.180717 (27923415)"
Patch description: "OCW RELEASE UPDATE 18.3.0.0.0 (28090553)"
ApplySession: Optional component(s) [ oracle.ons.daemon, 18.0.0.0.0 ] , [ oracle.assistants.asm, 18.0.0.0.0 ] , [ oracle.net.cman, 18.0.0.0.0 ] , [ oracle.network.cman, 18.0.0.0.0 ] , [ oracle.assistants.usm, 18.0.0.0.0 ] , [ oracle.crs, 18.0.0.0.0 ] , [ oracle.tfa, 18.0.0.0.0 ] , [ oracle.assistants.server.oui, 18.0.0.0.0 ] , [ oracle.has.crs, 18.0.0.0.0 ] not present in the Oracle Home or a higher version is found. Sub-set patch  has become inactive due to the application of a super-set patch . Please refer to Doc ID 2161861.1 for any possible further required actions. Patch 28822587 – Database Release Update Revision 18.4.1.0.0 is applied successfully and Database is upgraded from 18.3.2.0.0 to 18.4.1.0.0. From Oracle 12c,we are using dba_registry_sqlpatch instead of REGISTRY$HISTORY to check latest applied patches like RU,PSU and CPU. Patch description: "Database Release Update : 18.3.0.0.180717 (28090523)"
ApplySession: Optional component(s) [ oracle.network.cman, 18.0.0.0.0 ] , [ oracle.net.cman, 18.0.0.0.0 ] , [ oracle.assistants.asm, 18.0.0.0.0 ] , [ oracle.ons.daemon, 18.0.0.0.0 ] , [ oracle.crs, 18.0.0.0.0 ] , [ oracle.assistants.usm, 18.0.0.0.0 ] , [ oracle.tfa, 18.0.0.0.0 ] , [ oracle.assistants.server.oui, 18.0.0.0.0 ] , [ oracle.has.crs, 18.0.0.0.0 ] not present in the Oracle Home or a higher version is found. Service "dbwr.localdomain.com" has 1 instance(s). Service "dbwrXDB.localdomain.com" has 1 instance(s). Patch 28790643 – Database Release Update Revision 18.3.2.0.190115 is applied successfully and Database is upgraded from 18.3.0.0.0 to 18.3.2.0.0. In this article we are going to see the patching of OEM Server. Service "emrepdb" has 1 instance(s). Service "emrepdbXDB" has 1 instance(s). OPatch 13.9 in EM13c required the latest version of JDK. So download the latest JDK and install on my OMS Server.Copy & Paste of an OPatch directory is no more possible anymore. Launcher log file is /tmp/OraInstall2018-12-13_04-10-52AM/launcher2018-12-13_04-10-52AM.log. Move the downloaded system PSU patch to OMS server. Warning: weblogic.Admin is deprecated and will be removed in a future release. WLST should be used instead of weblogic.Admin. 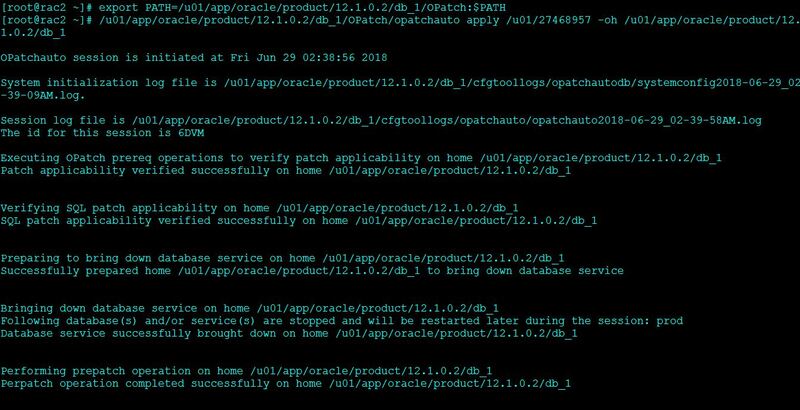 Sub-patch(es) "28717501" are successfully analyzed for Oracle Home "/u01/app/oracle/middleware"
All log file names referenced below can be accessed from the directory "/u01/app/oracle/middleware/cfgtoollogs/omspatcher/2018-12-13_04-58-11AM_SystemPatch_28717501_1"
Take backup of your OEM environment before you begin OMS patching. All log file names referenced below can be accessed from the directory "/u01/app/oracle/middleware/cfgtoollogs/omspatcher/2018-12-13_05-11-14AM_SystemPatch_28717501_1"
OPatch detects the Middleware Home as "/u01/app/oracle/agent"
The rolling upgrade refers to upgrading different databases or different instances of the same database (in a Real Application Clusters environment) one at a time, without stopping the database. The advantage of a RAC rolling upgrade is that it enables at least some instances of the RAC installation to be available during the scheduled outage required for patch upgrades. Only the RAC instance that is currently being patched needs to be brought down. The other instances can continue to remain available. This means that the impact on the application downtime required for such scheduled outages is further minimized. 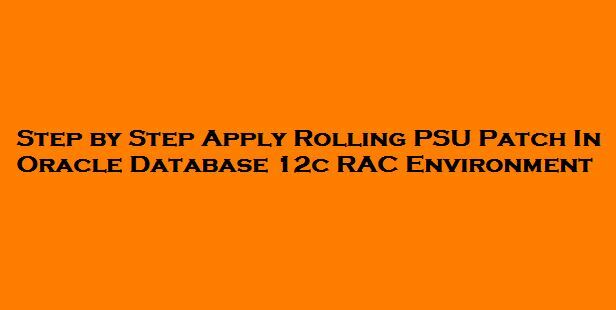 Oracle’s opatch utility enables the user to apply the patch successively to the different instances of the RAC installation. 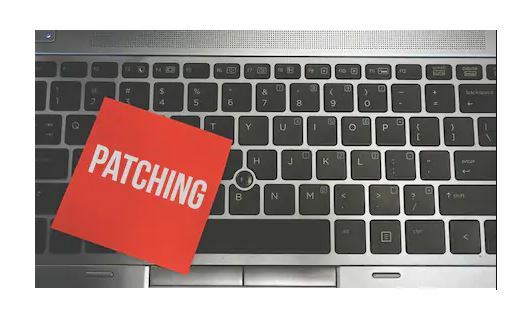 Rolling upgrade of patches is currently available for one-off patches and PSU patches. Rolling patch upgrades are not available for deployments where the Oracle Database software is shared across the different nodes. Before Opatchauto utility, we need to manually down the instance and cluster related services(prepatch.sh) before applying rolling patch. The GI System patch includes updates for both the Clusterware home and Database home that can be applied in a rolling fashion. 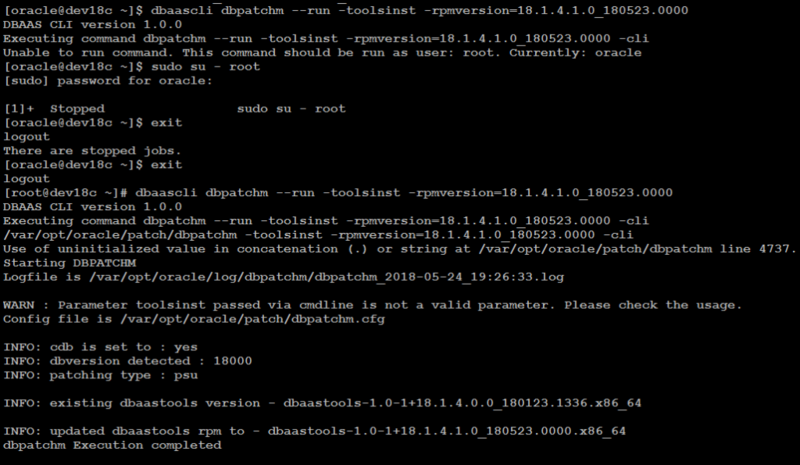 This patch is Oracle RAC Rolling Installable has to be mentioned in README.html. The patch 28349311 was the super seeded patch of database PSU patch. The above PSU patch is rolling applicable and so involves minimal downtime. Copy patch p6880880_122010_Linux-x86-64.zip to the node 2(racpb2) or Copy the unzipped OPatch folder to the node 2(racpb2). 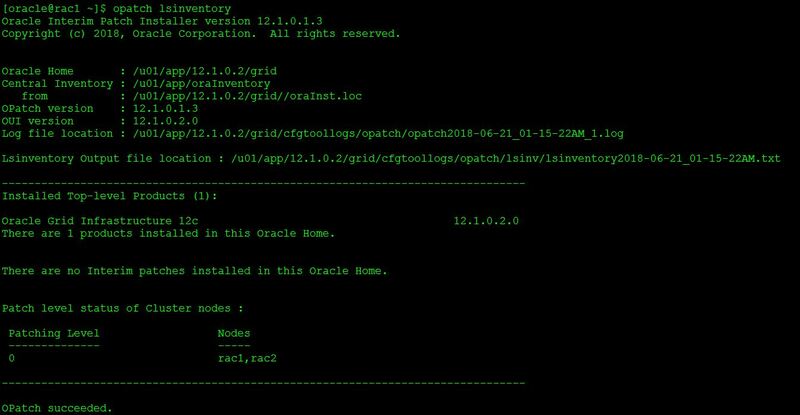 After upgrade the OPatch utility on both nodes apply the GRID and ORACLE_HOME PSU patches. When using OPatch 12.2.0.1.5 or later, the following Opatch Option -ocmrf <ocm response file> does not need to be provided. Now our current OPatch version for GRID and ORACLE_HOME is 12.2.0.1.16. 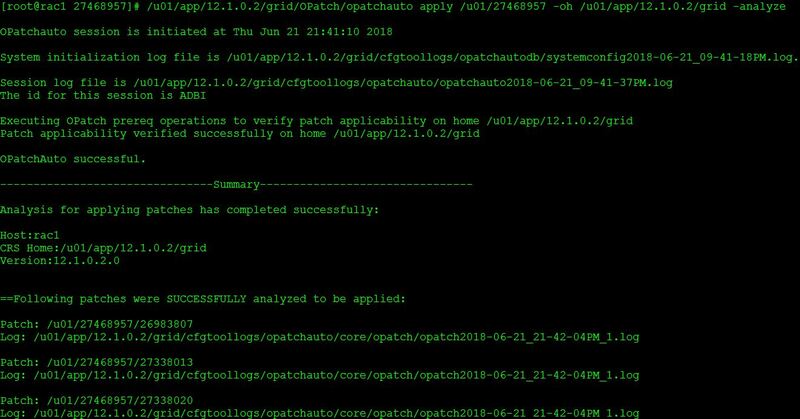 OPatchauto automatically patch the typical Grid Infrastructure (GI) and RAC home directories with minimal intervention. In general, when we invoke opatchauto will patch both the GI stack and the database software stack. Since we have mentioned the -oh it will apply the PSU to the specified home. 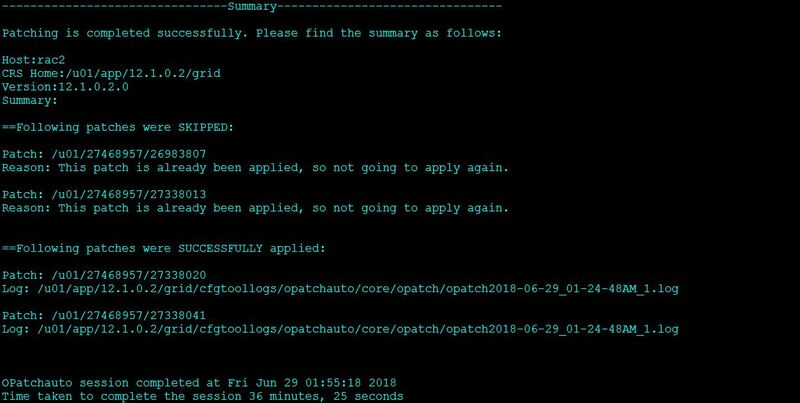 The main advantage of opatchauto utility was automatically down the CRS and database services and restart the services after apply patching. To apply a patch using opatchauto,we need to run as a root user. Here,we are going to apply a patch separately for both GRID and ORACLE_HOME in both nodes. 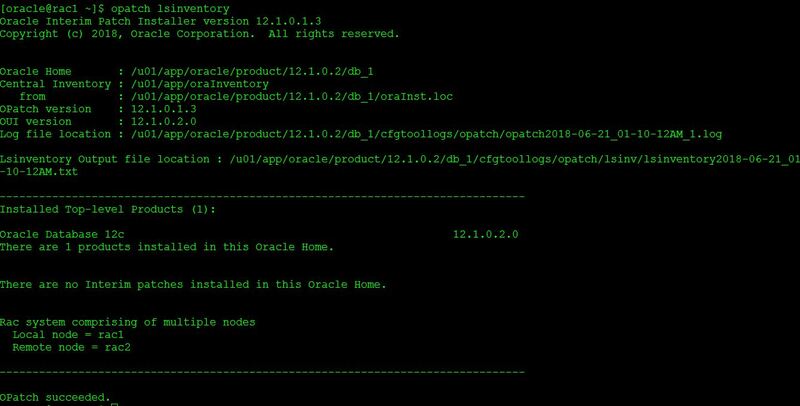 Follow the same Step 7 for applying patch using opatchauto for GRID HOME and ORACLE_HOME in Node 2. Rolling PSU patch (Oct 2018) is applied on both GRID and ORACLE_HOME successfully. Datapatch is the new tool that enables automation of post-patch SQL actions for RDBMS patches. So, In 12c you don’t use carbundle psu apply now this is all done using datapatch. OPatchAuto calls datapatch to complete post patch actions upon installation of the binary patch and restart of the database. As we already seen how to configure Oracle One node RAC in 12cR1 and the relocation of the instance from one node to another node. In this article, let us apply the July’18 PSU patch to the same environment. For Oracle One Node RAC configuration, please click here. Below is the configuration of the environment. From the above output,the opatch version is 12.1.0.1.3. But as per our README document, the minimum OPatch utility version shoul be 12.2.0.1.12 or later to apply this patch. 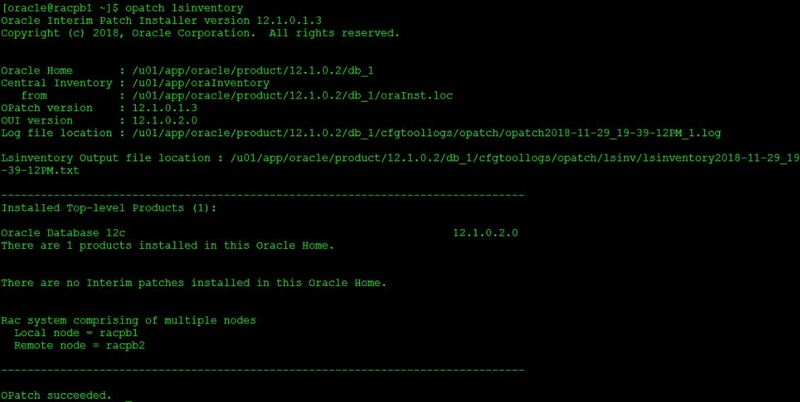 Oracle recommends that you use the latest released OPatch version for 12.2, which is available for download from My Oracle Support patch 6880880 by selecting the 12.2.0.1.0 release. Backup the OPatch directory as root user for GRID_HOME and oracle user for ORACLE_HOME(Database) in both the nodes of the cluster. Otherwise, if we try to backup as oracle user in GRID_HOME, we will receive permission issues. $ unzip <PATH_TO_PATCH>/p6880880_122010_Linux-x86-64.zip -d .
Now, as oracle user verify the OPatch utility version. Step 4:- Navigate to the patch location and follow the below steps to apply the patch. System initialization log file is /oradb/app/12.1.0.2/grid/cfgtoollogs/opatchautodb/systemconfig2018-09-26_02-40-10AM.log. WARNING: The service ORCL.oracledbwr.com configured on orcl will not be switched as it is not configured to run on any other node(s). Step 5:- Once the patch has been applied successfully, verify it in the database like below. Similarly, follow the same steps to apply the patch in Node 2. From the above output,the opatch version is 12.2.0.1.6.You must use the OPatch utility version 12.2.0.1.12 or later to apply this patch. 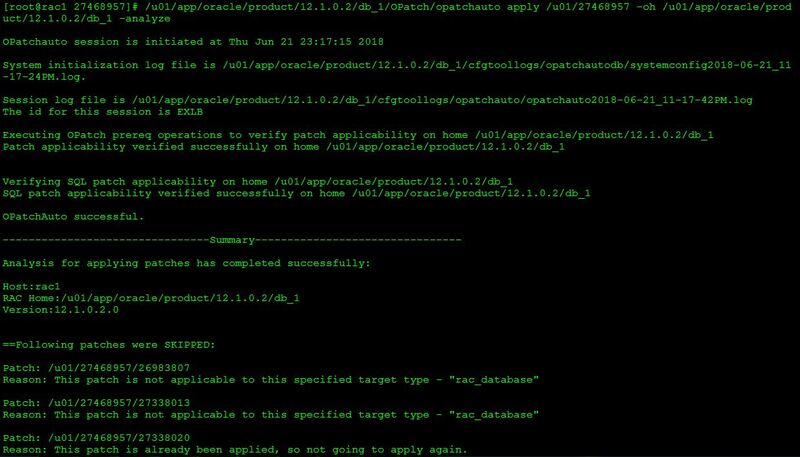 Oracle recommends that you use the latest released OPatch version for 12.2, which is available for download from My Oracle Support patch 6880880 by selecting the 12.2.0.1.0 release. Service "DG4SQL" has 1 instance(s). 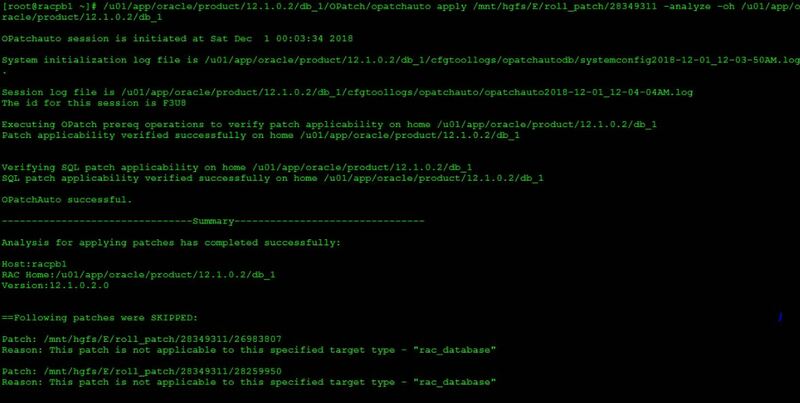 Step 7 :- Apply PSU patch on ORACLE_HOME. ApplySession: Optional component(s) [ oracle.oid.client, 12.2.0.1.0 ] , [ oracle.has.crs, 12.2.0.1.0 ] , [ oracle.ons.daemon, 12.2.0.1.0 ] , [ oracle.network.cman, 12.2.0.1.0 ] not present in the Oracle Home or a higher version is found. Service "orcldemo.localdomain.com" has 1 instance(s). Service "orcldemoXDB.localdomain.com" has 1 instance(s). Patch description: "Database Jul 2018 Release Update : 12.2.0.1.180717 (28163133)"
Patch 27468957 – Oracle Grid Infrastructure Patch Set Update 12.1.0.2.180417. Copy patch p6880880_121010_Linux-x86-64.zip to the node 2(rac2) or Copy the unzipped OPatch folder to the node 2(rac2). 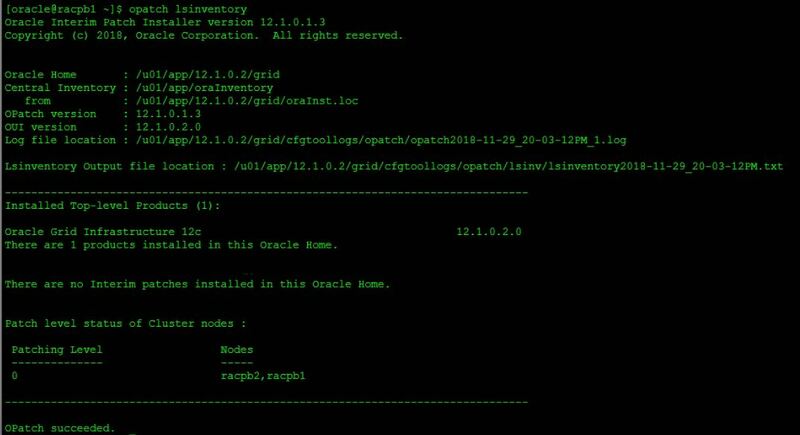 Now our current OPatch version for GRID and ORACLE_HOME is 12.2.0.1.13. 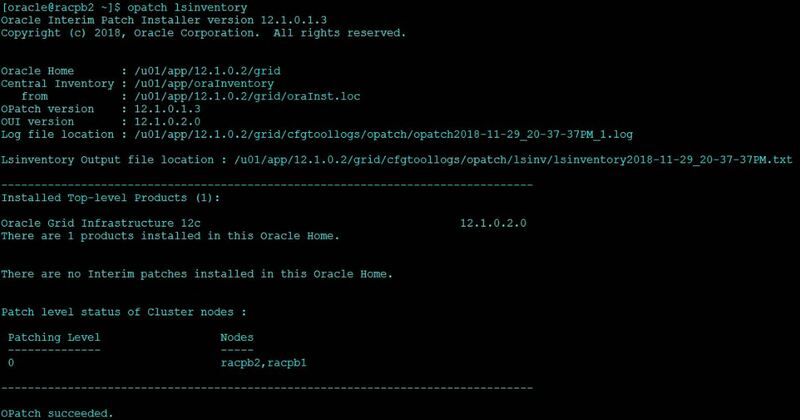 After the April 2018 PSU patch is applied on both GRID and ORACLE_HOME successfully. 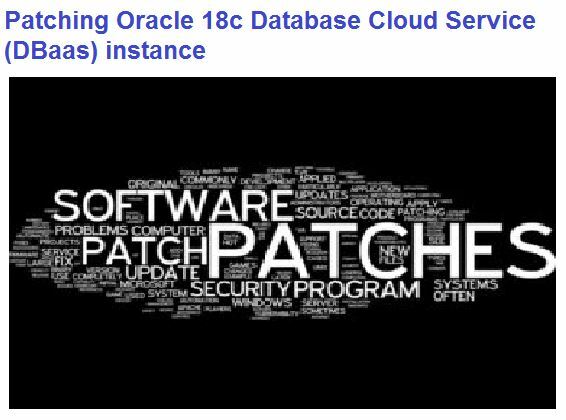 This article is realted to patching a DBaaS service on the Oracle 18c Cloud Database. 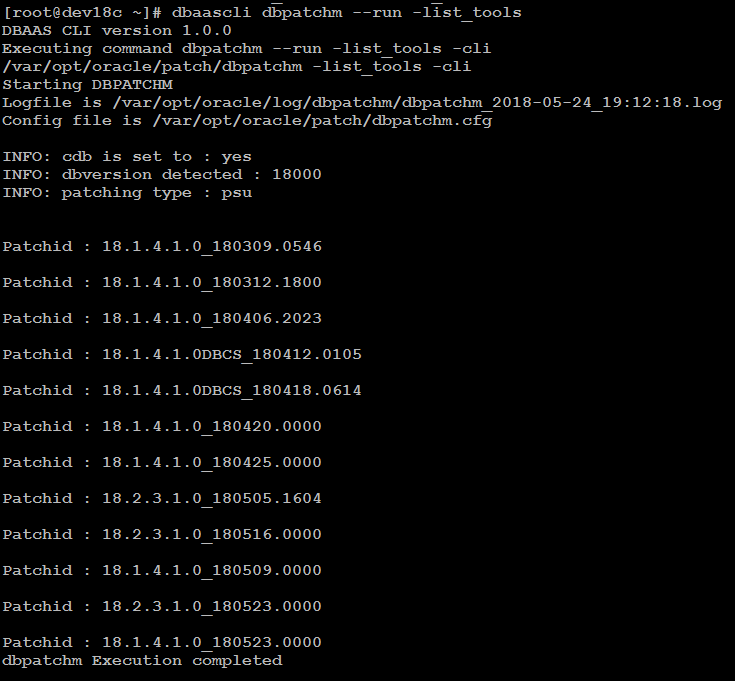 We are going to applying patch using dbaascli Tool. Log into your Oracle Cloud service account and navigate to the Oracle Database Cloud Service console. Precheck failed due to dbaascli Tool lower version. Login in to root user and check the DBaas Tool Version. Applying the patch using Patch menu item and start . Patching process is started & the database service is placed in maintenance mode. Checking Patch logfile from the backend.